You are about to go on a trip to Spain, Cuba, Colombia and Argentina. As you explore each of these countries, one of our student bloggers will be there to help you learn about each place and its unique characteristics. 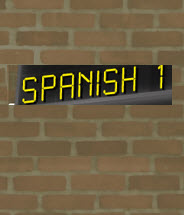 As you travel to each country, you will learn how to speak Spanish in many practical and useful ways. You will learn how to greet people, introduce yourself, speak about your home, family, school, and community. As you learn basic vocabulary and grammar skills, you will expand upon your knowledge and learn to speak about more complex topics such as shopping, weather, sports, entertainment and leisure activities. New words and phrases will be introduced with pictures, audio clips and examples. You will learn basic Spanish grammar to help you build your fluency and understand the structure of the Spanish language. There will be many opportunities to practice what you learn through interactive practice activities in the form of games, written practice, listening and speaking exercises. You will also explore the cultures of Spain, Cuba, Colombia and Argentina by learning about geography, foods, celebrations, and traditions from each place.